So I got the Dragon Dynasty release of One-Armed Swordsman by the Shaw Brothers Studios a little while ago and said I’d ramble about it later. I’ll still probably do one later on, but I have a further need to talk about the 2nd Dragon Dynasty/Shaw Bros. DVD that I bought: the 36th Chamber of Shaolin (also known as ‘Master Killer’). I saw it as a kid on TV (I believe it was USA’s Kung-Fu Theater) and this flick has been a part of me ever since. Sure, some people say that about flicks like Steel Magnolias, It’s a Wonderful Life or Soul Plane. Me? I say that about a Kung-Fu movie and the following is why. This film takes place during the Qing Dynasty era in China where the invading Manchus ruled over the people with little mercy. Gordon Liu (Johnny Mo from Kill Bill vol. 1 and Pai Mei from Kill Bill vol. 2) plays a young man named San Te who has a teacher that’s part of the underground revolution to fight the Manchus. When he and his group of friends see fallen revolutionary’s body on grisly display in the village and San Te calls him a hero out loud, he’s heard by an official who accuses them of being rebels. The three teens almost catch a beatdown until an elder breaks things up. The experience shakes them up to do just that: join the revolution. It’s there that he sees another member demonstrate the still-secret skill of Shaolin Kung-Fu. Unfortunately, the movement is discovered and the Qing forces start killing off any known revolutionaries, anyone that they think are in it, their family, friends and anyone else the bad luck of being in the way. After escaping the onslaught, San Te makes his way to Shaolin Temple to learn the kung-fu that will let him get revenge on the Qings and free his village. But being a Shaolin monk isn’t about killing. Well, unless you’re playing Mortal Kombat: Shaolin Monk where you’re allowed to shove someone’s head down their throat with enough force to make it launch out of their buttcrack and such. Here, not cool. San Te accepts their terms which leads to some of the coolest and insane martial arts training sequences in movie history, period. Hollywood flicks train heroes by having them chase a rooster in a circle or shine up a car. 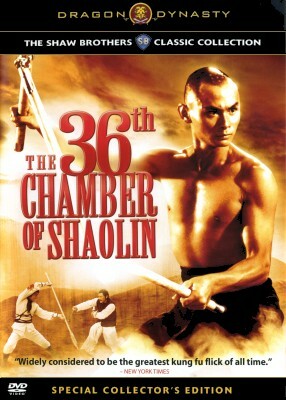 This is a Shaw Bros. flick directed and choreographed by Hung Gar master and Gordon Liu’s mentor, Liu Chia-Liang (a.k.a. Lau Kar-wing) so all half-stepping is prohibited. Each training sequence is one of the 35 Chambers of Shaolin Kung-Fu skill. There are many reasons why fans geek out over the chambers. For one, each chamber is imaginative, painful looking and difficult. The first chamber is on the way to the chow line. If you don’t learn, you don’t eat! That’s cold-blooded! Even better is that the only way to defeat each one is an equal balance of physical and mental power. Unlike most movies, his training doesn’t just make him a stronger fighter, but a better human being. That’s deep.. Of course, he still goes on to kick large amounts of assflap, but that’s where the other brilliant part comes in. Besides the fact that each fight is filled with skilled martial artists and actors who battle each other with very little wire work or cutting, you will see the actual chamber lessons and skills used in the midst of the fight now matter how trivial they seemed at the time. The chamber that tested how quickly San-Te’s eyes could track an ever-shifting target comes into play and blends into another chamber lesson. Unlike other flicks that awkwardly shoehorn the moments into a plot later in the film (along with a quick flashback just in case you forgot) , the chambers and the Shaolin philosophy form the foundation of San Te’s actions. Yes, all that stuff that the monks talk about is more than just random mumbo-jumbo here. The more that I think about it, the more it makes sense that this was directed by an actual teacher. This Dragon Dynasty version of the 36th Chamber is from the Celestial remastered print that has a crisp look to it. In other words, this isn’t from some old VHS tape with damage lines rolling through it. Language tracks include Mandarin, Cantonese and the same English track that U.S. Master Killer and Wu-Tang Clan fans know and love. Oh… and the RZA provides commentary along with Andy Klein. As a Wu-Tang fan since the Protect Ya Neck/Method Man single, it was great to hear him drop jewels on Chinese history and point out film-making bits, cameos and trivia. He also brings up a lot of childhood stories about watching this and other flicks that I’m going to devote an entire post to one day. They should get those two to do more commentary for future flicks, because they make a great team. Other treats include a brief documentary on Shaolin and an in-depth interview with Gordon Liu. As much as I enjoyed One-Armed Swordsman’s interview with Jimmy Wang Yu, the Gordon Liu interview was even better. He talks about everything from how Lau Kar-wing took him in as a brother to how people thought that he looked a bit like Yul Brenner after he shaved his head. He seems like he’s having a lot of fun during the interview, too. I’m hoping that Celestial/Dragon Dynasty can get a Lau Kar-Wing as Andy Klein (I think) mentions that the director still does great and lively interviews. Also included are film trailers to this and other movies made by the crew. With the two movies that I have already, Dragon Dynasty does such a great job that they are to Martial Arts films what Anchor Bay is to cult and horror flicks. I never thought I’d see U.S. releases with so much effort put into them, but that’s exaxctly what these are. If you’re looking for mindless violence, this isn’t your flick because they’re are long stretches of time without any actual fights. But if you appreciate martial arts movies that are skillfully done, you’ll be rewarded by those great training scene that help to make the amazing fights even better. I think I’ve rambled enough about it, so buy it or rent it. After all, it’s the closest most people will get to watching a classic kung-fu flick while chilling out with the RZA.